We also hit a tangent about the death of the SciFi Channel. Summer rants. And she’s not the only one who’s a tad annoyed. Not by a long shot. Now she wants to implement a plan to create her owned damned spec-fic channel. Not a Cylon plan, but a plan nonetheless. Discussion: In honor of Show #150, Jeffrey wonders how in the world we’ve done more podcast episodes than actual show episodes in existence, and Mike wonders how this tiny show grew to have a gravity well strong enough to pull him and Brad in for keeps. And then the talk wanders into the realm of space junk, and completely hijacks the intended topic of discussion… again! I am not completely through with the episode, but just listened to most of the interview – and this show is one of my favs throughout the four years. Stephen is hilariously funny and it was great to get his perspective on things (when he remembered 😉 ). Very nice show, thanks everyone. I’m still listening to the episode myself. I wish Stephen was this animated when I saw him at my last con. I guess I’ll have to ask better questions. This was an awesome episode! This interview with Furst may be one of the best you’ve ever had of any cast/crew member! Even better than Claudia Christian’s drunken ramblings years ago! I haven’t finished listening to the interview but to the question about the “Dedicated to…”Faith Manages” message at the end of the episode, it *was* in the script although it wasn’t in the draft picked for the Script books. Stephen was sick the weekend that we saw him, though, Gary. I recall him saying something about running a high fever. No, it wouldn’t have been in the Joe Cuts. Since it wasn’t in the draft of the script JMS chose for the script book I, like Jeffrey, thought it was part of the credits, not the episode. Up until I got curious and checked the shooting draft, that is. The script book draft is dated 7/8/97, the next draft that I’ve got is dated 8/4/97 and the card isn’t there. The blue revisions which seem to be the shooting script is dated 8/12/97 and the card is there. I loved the Stephen Furst interview. maybe the best and funniest ever. I love how he takes credit for everything that happened on the show because coincidently I had just proven a few weeks ago that he is the center of the Babylon 5 universe. I created a star chart I call “5 degrees of Furst” in which all 16 of the major players in B% are interconnected with him through his different projects. I sent it in to Tim, so hopefully he can post it somewhere. I would have liked it if someone had asked him if he had read any of the B5 books which take place in the timeline after Season 5. Specifically, the Legions of Fire which resolves the Centauri sub-plots very nicely. I would like to get his reaction to the fate of Vir. 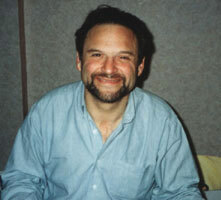 I am officially in love with Stephen Furst. He’s adorable. Just had to say that.